Nominate Innovative Motorcoach Operators Now! Does your private motorcoach operation stand head and shoulders above the rest in terms of innovation? Do you know of an operation that provides excellent service or has unique programs in place? 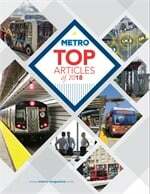 METRO Magazine wants to hear from you. Drop us a line now at [email protected] to be included in our annual Innovative Motorcoach Operators feature in the January 2013 issue.